This review originally appeared in the online version of FREE! Magazine October 2007. Used with permission. This is the first of album by Bruce and the E-Street Band since 2002’s The Rising and their first concert since the band wrapped up their historic run at Shea Stadium in New York four years ago. The first thing that hits you as you listen to Magic is just how damn catchy the songs on the album are. Springsteen went out of his way this time to write an album with a lot of pop elements, and it shows. From “You'll Be Comin' Down” to “Livin’ In The Future”, the melodies are infectious. It’s easy to picture yourself driving down the road with the top down, singing along to the CD, watching the “Girls in Their Summer Clothes” walk by. Don’t be fooled, however. A dark and unsettling undercurrent runs just beneath the surface of this album. Neatly packaged and disguised underneath great pop melodies and hooks, are feelings of uncertainty, alienation, and malaise. Springsteen’s album The Rising dealt with the shared loss and grief felt by an America in the weeks and months following the September 11th attacks. Magic describes an America that, in the last six years since September 11th, 2001, has lost its way. The track “Long Walk Home” tells the tale of someone who returns to his hometown and finds that the place he once knew is unrecognizable. The very truths and ideals that he thought were shared by everyone are gone. 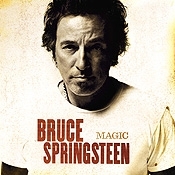 The unease becomes more apparent on the title track “Magic” with its ominous lyrics of trickery. The song, as Springsteen mentioned during the show in Hartford, deals with the ability of politicians and those in power to make their own reality. Listening to “Last to Die”, with its blistering chorus of “Who'll be the last to die for a mistake?”, the allusions to the Iraq War are hard to dismiss. Tuesday’s concert in Hartford centered on a trilogy of songs that thematically summed up the last six years of American history. “The Rising” (a song about a NYC firefighter rushing into the Twin Towers on September 11th) segued to “Last to Die” which then led into “Long Walk Home”. As Bruce yelled to the Hartford crowd “It’s your country, don’t let anyone take it from you”, he finished the show with “American Land” from his Seeger Sessions album. He reminded us all of what we should be fighting for.